Drawing with Ink for Inktober! A few people have asked about the drawings I’ve been doing lately. They are for an art project that occurs every year called #inktober. The challenge is simple: each day in October, you have to draw a picture in ink. Each day comes with a prompt. You can see those as the captions for each of the drawings below. 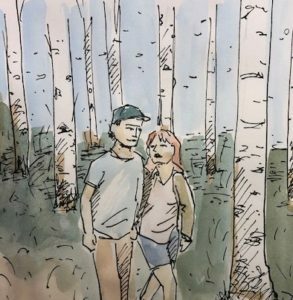 The creator of #inktober, Jake Parker, posts the prompts on his website each year. I really enjoyed drawing “Tranquil.” I’ve been doing so many monsters and cats lately, that it was refreshing to just draw a nice couple out for a stroll in the birch trees. Why birch? Because they are fun to draw. I think they are some of the most beautiful trees out there. And don’t these two look happy. You may think that I draw in ink (India ink to be exact) then, apply water color. You’d be half right. I use a dipping, nib pen or a brush for the drawing. However, I also color with ink. As you can see from the picture below, I only use yellow, red, and blue. I mix everything from that. Why? Two reasons. I like the challenge of mixing from only the primary colors. It improves my mixing skills. You may wonder how I lighten the colors without white. The paper is white. I’ve learned how to thin the ink with water to let the white of the paper bleed through. 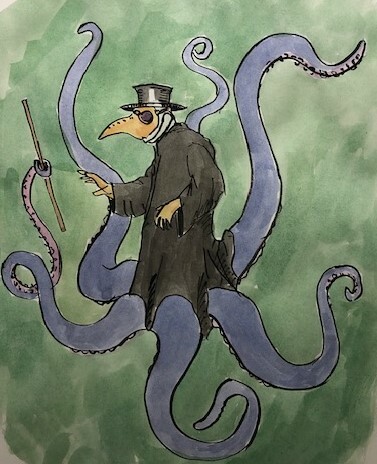 This drawing is called “Poisonous.” For it I imagined a medieval plague doctor in his costume, but with a twist. If you are unfamiliar with this strange costume, you can learn more about it here. 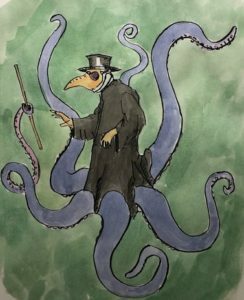 I’ve re-conceptualized the doctor doing his house calls as a six-tentacled creature. There is not telling what is going on behind that weird mask and black coat. He’s handing himself his stick, preparing to set out to see his next patient. Coloring with ink has a lot of drawbacks. It is even more unforgiving than watercolor. You get one shot. You make a mistake and you have to figure out something else. Ink is permanent. Believe it or not, this was my first draft of “Tranquil.” That’s one of the things I love about drawing. Once you get started there is no telling where it will end up. My first idea was to tell the story of a lovely mermaid , enjoying the peace and quiet of a cove. That weird bird in the bottom left corner crept into the image. At that point, I had to tell the story of the look on his face. What came to me was a mermaid who had special powers, even beyond her traditional ones. Notice the wings! Exactly. Where did those come from? I don’t know, but they are awesome. Anyway, her story came to me as a revenge plot. 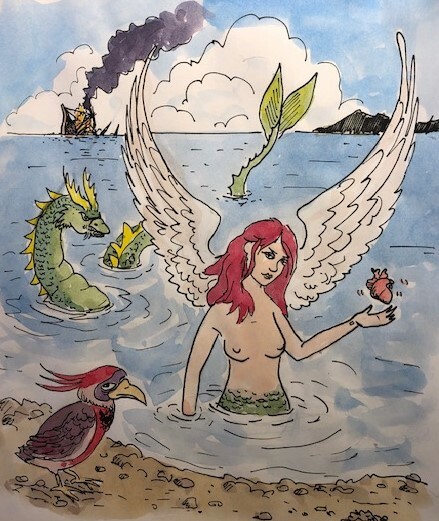 The sailing ship in the background got roasted by her sea serpent friend and all that is left of its crew is the heart of her treacherous lover. I’m so glad you’re here on this page. You must be the kind of person who appreciates art. I’m a working artist, so all drawings that you see are for sale. These are sketches and if you like one of them, I can work up a “cleaner” one on heavy watercolor paper. Those of you who’ve bought drawings from me at various shows know that these drawings look amazing in a black frame and become instant conversation pieces. I’m also open for your unique commissions… the crazier the better. Not long ago, a wonderful art patron asked me to draw a purr-atrooper for her at Comic Con. It was a cat, dressed in an American Ranger uniform, parachuting into Nazi Germany. Just contact me with the form below for pricing and details. If you’d like to keep up with my Inktober challenge, follow me on Instagram. You can find me at @dsborden.